This piece has been taken two years to materialise on the blog. I've chipped away at it for some time but finally got some space to complete it. The occasion was the planning my Dad's funeral service - and the events are as described. The planning of a funeral, probably not an activity that one would choose freely, but an inevitable requirement of the dying process (or the processing of the dead). In hindsight, it was, for me, a piece of the "closure" jigsaw. However it fits into the scheme of things, that was the task of the day. I was in a two car convoy with my two sisters and two brothers in law, on the way to the church house to meet Father Gordon, the priest who would be conducting my dad's funeral, in order to determine the order of service. One of the things I've learned over the last 18 months is that the process of working through the death of a family member is punctuated by moments of the surreal, moments where one seems to be on the outside looking in, viewing an event that isn't part of your own life, engaging in conversations that you've seen other people have but that aren't your conversations; it's like reading words from someone else's poorly written script. This was such an occasion and the feeling was amplified by the fact that I hadn't had such priestly conversations in relation to either my mum's or brother's recent funerals. The former was sensitively handled by my dad and sisters, and the latter was an equally moving, but altogether more secular affair organised by my brother's ex wife and daughter and his many friends in the North of England. 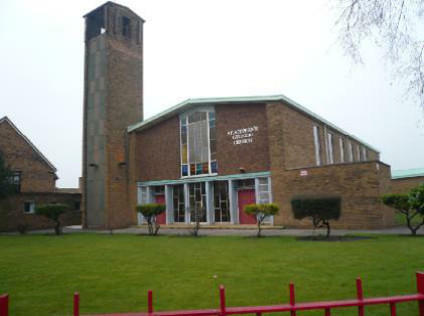 St Stephens church (our destination), a drab late 50's plain, brick built affair standing proud of its working class surroundings, was a huge achievement for the devout and bulging post war, baby boomer, congregation. I have only vague memories of the parish priest of my youth (Father Dillon); big, proud, and imposing are the only adjectives that spring to mind when trying to remember him and I'm sure that is a disservice to a man about whom my parents had nothing but good things to say. With regard to the church itself, I feel that it's important to make a personal distinction between function and representation. It functioned, amongst other things, as a marker of births, deaths, and marriages, a congregation point for the faithful, an absolution point, a celebration point, a refuge, a place where (in theory) one could connect to like minds, and a place where one could experience a unique form of "quiet". At my most cynical I would see its function as a pound shop for washed souls, a provider of absolution from earthly responsibilities, but that would be somewhat unfair. In terms of representation it had deeper, more meaningful, more pervasive meanings for me. As a young boy it represented a conduit to my parents approval (and the approval of my wider Irish-Catholic community family), a place to assert myself as separate from most others of my age (as an altar boy), an extension of my everyday life, but a place about which I "felt" very little. As an adolescent it represented something altogether different, and over time it came to signify containment, confusion, and embarrassment. It was a palpable layer of the skin of my identity that I was determined to shed in order to emerge into a new and more exciting world as an independent thinker, an adult.....and now, some 40 years later, and a middle aged man, I returned. I'd packed a sample of Karuizawa 1984 to give to the priest, Father Gordon, and was looking for a suitable opportunity to slip it into the conversation, not an easy task as I'm sure you can imagine! "Why on earth would you even consider taking whisky to such an occasion?" I can hear you ask...and it is a good question! On reflection, the answer is somewhat elusive and I don't really know for certain. However, there are two possibilities that occur to me, one located in my unconscious processes and one firmly grounded in conscious awareness. Firstly, I was in totally unknown territory, I didn't know what to expect, I didn't know how I would react, I had no understanding of the "tone" of the gathering, the protocols, the discourse....and yet I had in my pocket something about which I possessed high levels of confidence, something that I associated with pleasure, something that I could talk freely and passionately about to any willing listener, it was full of positive associations, like a touchstone grounding me to a less challenging, warmer place; simply feeling the small glass bottle in my pocket and knowing what it contained provided me with some semblance of certainty in what was an uncertain situation. Secondly, in my experience most Catholic priests like a drop of whisky and, despite the context, giving something of high quality to someone who will undoubtedly appreciate it is simply a nice thing to do. We were escorted into the reception room where matters of God and Earth are often clumsily and sometimes seamlessly fused together. It was a nondescript but unbelievably powerful room, a decompression chamber in which the outpourings of elation, euphoria, despair and despondency served to save supplicants from attacks of the emotional "bends". It was, perhaps intentionally, minimalist (after all, this was no one's permanent home); it was Spartan, there were the obligatory icons (Christ on the cross, the holy Trinity etc), a half empty bottle of sherry and a few standard whiskies located on a shabby dresser, stale wallpaper, non-descript blinds, it was clean and non-offensive, a blank canvas into which it was the job of the attendants to infuse meaning, (with the priest acting as conductor). It was dominated by a big, bold, old, oak table; a solid, stark, immovable, and austere block of timber onto and into which decades of emotional effluvia had been poured; we seated ourselves around its looming presence. Over many years this table had been a silent witness to a full range of human suffering and joy and it was as if a patina of guilt and elation had formed on its knotted top as a result of both the physical and the emotional contact; forlorn palms resting on the unyielding surface, weary elbows supporting desperate, heavy heads, nervous forearms, excited knees brushing against other excited knees, and tears, an infinite variety of tears had rained on this table; flurries, leaks, drips, streams, reluctant, begrudging tears, grateful, too easy tears, joyful, effusive, uncontrolled tears, voluptuous, splash, mascara crisis tears. As we began to talk and I wondered whether more tears would fall, adding to the saline testaments of past encounters. The conversation was as you might imagine, somewhat formulaic, that was until, in a not uncomfortable pause, I drew the sample from my pocket and asked the question "Do you like whisky Father?" Now many of you will have been in that position, when you've asked someone if they like whisky and “that thing” happens. Firstly, the change in the eyes, a modest dilation of the pupils followed in a split second by the elevated eyebrows and then, maybe a second or two later, the slight smile evolving into something much more expressive, that look of playful joy that transcends anything that was going on before the question was asked. Well, that happened, in the church house, in the austere room, around the oak table, where we were discussing my Dad's funeral service, and for the next 10 minutes the room seemed smaller as we talked whisky. It didn't seem irreverent, it certainly wasn't disrespectful, there were smiles from all in the room (albeit good natured smiles of incredulity from my sisters), and, had my dad been there, he would have laughed, indeed, I would have given all the whisky in the world to hear his laughter at that moment (and each day since). The usual whisky "icebreaker" questions were exchanged "Do you have a favourite?” “How long have you been passionate about it? ', "Do you like peated whisky?" .....and so on. It transpired that Father Gordon had the whisky passion, had his favourites, and had a small collection of 50-60 bottles upstairs. A few minutes into the whisky conversation Father Gordon asked "Do you like grain whisky?" I answered in the affirmative and could tell from his response (a slight furrow in his brow and a flattening of the affect) that he didn't feel the same way..."not really" he answered. My response was, perhaps, a little hasty, even defensive, "Why is that Father, are you a whisky snob?" "No, no, no" he said, "grain whisky gives me a terrible headache, I've tried to get on with it but I always end up with a bad head the next day....I don't drink it anymore". Now, I'm no doctor, I spent the first 15 years of my working life as a nurse but not in a medical services context and so my knowledge of the validity of the connection that Father Gordon was making was minimal at best. Anyway, whilst it might not have seemed apparent, I still retained an awareness of the context of our meeting, and a discussion of the physiological "truth" in his attribution was not appropriate. I was about to suggest that we return to the purpose of the gathering when he reached purposefully behind his chair and opened a door in the dresser, recovering a large and sturdy black box, he had to use two hands to put it onto the table. "Have you seen this before? he asked, and slid the box along the table. I knew it was whisky, what else could it be? It was a sturdy, matt black box with small gold panel on the front identifying the contents, I realised what I was looking at and gingerly opened the box; it was an unopened bottle of Johnny Walker King George V whisky. I took the bottle in my hands and admired the obvious care and attention that had gone into its production, the accompanying certificate, the considered wrapping, etc. I also knew that it retailed at between £400-500. "I've seen it advertised Father but it's out of my price range and I've never tried it"
"......sorry I didn't catch that Father"
"Have it.....please, I want it to go to someone who would appreciated it. It was given to me by a parishioner and I didn't have the heart to say no, please take it." "....I can't Father, it's too much"
I wasn't feigning my reluctance, it was exactly as I said, it felt like too much of a gift; as if from nowhere, I was being offered a high priced (and probably high quality) whisky, in the most bizarre circumstances. It felt almost as though I'd engineered this, but how could I; this was totally out of the blue. For a few moments I felt a little embarrassed by the sheer extravagance of the offer. I also felt speechless, which, for those who know me will realise, is a very, very rare occurrence. Was he being serious? Did he mean "a sample" or had I heard him correctly? I looked up from the whisky and saw the look of genuine sincerity in the priest’s eyes, he meant it, to him this was a gift, not an act, not some "hair shirt Catholicism", it was a gift and I sensed a genuine pleasure in the act of giving. I was tearful but refrained from sharing my tears with those present (or the table), and at that moment a shard of cynicism was gently removed from my side, there was no gasp, no outpouring, it wasn't an epiphany, it was a brief moment of connection that generated such a range of emotions, the most powerful one being humility. There was a moment of quiet, a few seconds to digest what had just happened, before returning to the matter of the hymns and psalms that would mark my Dad’s passing. We returned to Dad's house and for the rest of the evening I inhabited a somewhat creative and reflective place that enabled me to construct a short tweet sized communiqué that I later extended into a poem, read at my dad’s funeral. Has less meaning in this moment. Postscript: At the wake after my dad's funeral a couple of weeks later, I gave a selection of "world whisky" samples and a bottle of 21yo cask strength Wine Society Mortlach to Father Gordon. He seemed genuinely excited by the gifts, we had a brief chat at the bar before he had to resume his duties, leaving to visit some of his parishioners. Nose - Malty digestive biscuits, some citrus notes (oranges), toffee apples, a creamy smokiness (there's some Port Ellen in the blend), well-balanced oak notes. Palate - Fruity, malty, slight peatiness fused with some maritime influences, some lovely leathery "old bookshop" notes. A lovely whisky indeed!